Image Courtesy of International Sani-fem Inc. The Freshette is a female urinary director, to allow a female to urinate while standing. The basic piece that is part of all models is the hard plastic funnel which gets placed against the body. The Sports/Travel model comes with a 5 in (12.7 cm) long tube, and a plastic zipper-lock pouch. The tube is cut on an angle at the discharge end, and is slightly wider at the end which inserts into the funnel, with a seal. The tube can be pulled back into the funnel for more compact storage, and extended for use. The funnel itself is smooth on the inside but has a slightly rough texture on the outside. 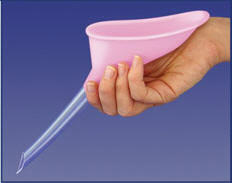 The plastic funnel can be pressed upwards and drawn forward when finished urinating to capture any remaining drops. I added my Freshette to my gear in 2008 before embarking on a several-month long backpacking trip. I carried it in my backpack for 4.5 months, and then have carried it intermittently since then. I have probably used the funnel a couple hundred times, but only 20 or so times in the backcountry. It has been used in trains, planes, public restrooms, and occasionally in the bush, in all seasons. I have used the Freshette while wearing hiking shorts or pants, climbing gear, winter clothing with various levels of layering, and coveralls. When I first heard about the Freshette, I thought it was the greatest thing since sliced bread, and I made sure I purchased one before embarking on my long trip. I found on that trip that the Freshette remained in my pack just about every time I went to pee. Early in the trip, while backpacking, I used it quite frequently, but quickly found that the effort required to take off my pack, dig it out discreetly, tromp into the bushes, use the Freshette, put it back in its pouch, put it back in my pack discreetly, and re-shoulder my pack was more trouble than just squatting to pee. It quickly fell out of favour, and for the rest of the trip it was used almost exclusively in really disgusting bathrooms on trains...if I’d remembered to get it out of my big pack before getting on the train. The other issue I had while hiking was that after using it once or twice and putting it back in the pouch, it started to get a little rank, and using it was highly unappealing. I’ve never carried it while hiking in the summer since that first long trip. When I’m dayhiking it’s certainly slower to use the Freshette, since I don’t even take off my daypack to squat. I tried using the Freshette with my climbing harness on, thinking it would be great for long climbs or rope rescue. Although it certainly is good from a modesty point of view, I found no other benefits to me personally. On a climb, I’d have to carry it along, and at a rescue I’d have to go find it in my pack. I am capable of squatting to pee while wearing my harness and being tied in. I should say that the first time I tried to use it with my harness on I was wearing 4 layers of pants without a fly, in addition to the harness, which made actually getting the funnel against my body next to impossible. I have had success using the Freshette in the winter while ski touring, purely from a “staying warm” perspective, but even then I don’t usually bring it with me. I often wear 3 layers of underwear and long underwear that do not have a fly, and I have found it difficult to get the Freshette manoeuvred into place and sealing properly with so many clothes. There is one situation in which I use the Freshette on an almost daily basis (co-workers stop reading here!). It has a semi-permanent home in my desk drawer at work. In order to use the toilet at work, I have to remove a vest, radio, and the top half of a pair of coveralls (plus pants and underwear), which is a pain. I use the Freshette either with the 2-way zipper on the coveralls (they are clearly designed for a guy! ), or by unzipping the vest and coveralls for a little more access room. I can then rinse the Freshette immediately and put it back in its pouch and in my desk. When I first got the Freshette, I practiced at home to make sure I knew what I was doing before venturing outside. I’ve thankfully never had any issues in the backcountry, but I have had the odd “leak” event, usually caused by getting a piece of clothing caught between the funnel and myself, and once caused by not pulling the tube out fully until it sealed. Those events were rather embarrassing (to myself, no one else knew until now!) and I am now very careful to make sure everything is set up right. I mentioned already that the Freshette gets rather rank after multiple days of use. I am happy to note that it returns to being smell-free once washed with soap and water, and the plastic pouch does as well. In general, the Freshette is easy to clean, I just give it a rinse most of the time and it stays scent-free. I find the Freshette quite bulky and large, which makes it hard to carry discreetly. It takes up a lot of space in the top pocket of my pack, and is too large to carry in a pocket. I almost never carry a purse, so using the Freshette in an urban setting is generally not an option. 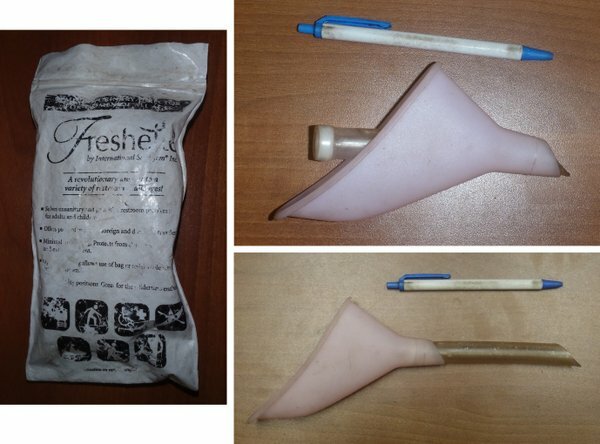 The Freshette is a female urinary director with a funnel made from rigid plastic and an extendable tube. It has proved to be occasionally useful to me on winter trips but has made a home for itself in my desk at work.